If you are running a small business, you will absolutely be using an accounting software because it makes the business run smooth and you can see whether your company is going in profit or in loss at the click of a button. You can also take preventive measures to prevent the loss and make gains in profits. Unfortunately, the big names in accounting software have very complex software because it needs to be suited for so many varieties of businesses. A simple small business owner needs a simple accounting software which can do his job quickly and easily without any hassles of entering a plethora of information. Manager is free accounting software for Windows which can be termed as the perfect choice for small businesses. It features a very intuitive and easy to use interface which even a novice can also operate. After installation, when you run Manager for the first time, you will need to create a new profile. 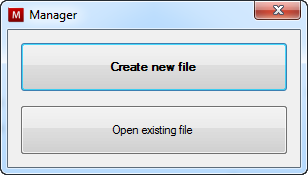 The Manager profile is create with the extension as .manager. The interface of Manager free accounting software is quite intuitive and easy to understand and use. On the left hand pane, it will display a list of actions and reports that you can take. It is as simple as entering the money in entity for receiving money and money out for outward payments. The receipt and payment entry is also very easy to fill out. No complex entries. Just enter a few basic questions and you’re done. It also features the invoices and bills for customers and suppliers. 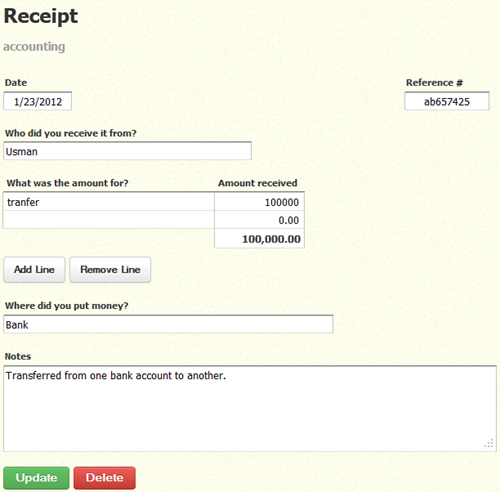 You can create and print invoices to give to your customers and bills can be printed and given to the suppliers. There are three basic accounting reports that can be created using the Manager software, Journal entries, profit and loss statement and balance sheet. Since most of the small businesses need only these reports, Manager does a good job in organizing and compiling these reports. You can also print these reports from the software interface just by clicking the print button in the toolbar. Another interesting feature about Manager that I have found to be very useful is that it can also be used as a web app. You only have to start the software and you can access it anywhere by using the URL of the web app. To start using via web, just click on the Web access button on the toolbar in order to start the app in the default browser. You can also access it remotely by using your IP address instead of localhost in the address bar. But you have to keep in mind that opening the port on which Manager is operating is very important otherwise it will not be able to get access from outside of the local network. Unfortunately there is no way to change the port on which Manager is operating. You will need to open the same port as used by Manager. Another thing that I think is lacking in Manager is that I can’t organize all my accounts (Bank accounts + Cash accounts) within the Manager app. This seems to be a very basic issue and needs to be sorted or very soon. I hope the developer of the software will do something about this issue in the coming releases. Additionally if you are looking for investments and partnerships in your business, the best way to do this is to use P3 software. For those who don’t know abaout P3, also known as PPP, it means Public Private Partnership in which a business is funded and run by a partnership of government and private sector companies. This can be extremely hard to achieve without any financial software involved. You can also use PFI software to create the P3 partnerships among the government and the private sector. Please give download link to Software.